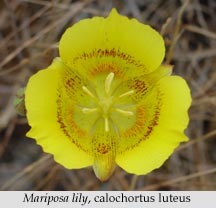 A large, hitherto unknown, population of yellow mariposa lilies, Calochortus luteus, was discovered in late May, 2002 at Hunters Point by CNPS Yerba Buena Chapter member Margo Bors. For many years the only known population in San Francisco has been in Starr King Park on Potrero Hill and is very small, about 60 plants. Margo, who has done habitat restoration at Starr King Park, noted the yellow mariposas occurred in a rocky serpentine area with thin soil. From earlier explorations she knew there were similar areas in Hunters Point. When the lily came into bloom at Starr King in late May Margo decided that would be a good time to search for it at Hunters Point. She found it in the fenced off abandoned hillside across from India Basin Shoreline Park. The lower part of the area, Margo says, looked like an abandoned lot – weeds, debris, partly burned. The upper part, however, already dry and brown, looked promising. Normally the lilies would not have been very visible in the tall grass but it was late afternoon when Margo explored the area and the sun was low behind the hill creating a luminous backlight. The mariposas on a small ridge higher up the hill stood out like glowing coals. Margo said she knew immediately exactly what they were. Nassella pulchra, purple needle grass, is the state grass of California. Serpentine, an unusual green rock that occurs along old fault lines, is the state rock of California. 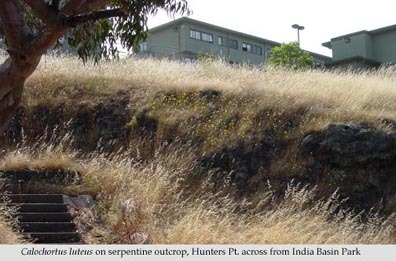 Both, along with the Calochortus are abundant at the Hunters Point site. A sepentine grassland such as this is said to be more rare than old growth forest. It would be wonderful to be able to preserve this natural heritage for present and future generations.